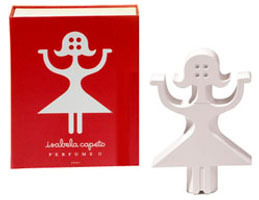 Earlier this spring, Brazilian designer Isabela Capeto launched her second fragrance for women, Isabela Capeto II. The "fresh and delicate" new scent "captures the essence of a Brazilian summer". The fragrance notes include marine notes, lemon, lime, tangerine, rhubarb leaves, freesia, magnolia, muguet, jasmine, rose, iris, cardamom, wood, sandalwood, amber, musk and vetiver. Mandarina Duck has introduced Scarlet Rain, a new fragrance for women. Scarlet Rain was developed by perfumer Guillaume Flavigny; the notes include redcurrant, blood orange, red orchid, rose, cyclamen, amber, musk and benzoin. That “Isabella Capeto” bottle is something else–it's hilarious! Although the brew doesn't sound like something I'm normally up for, I'm aching for something different and I might give it a try. “Scarlett Rain” doesn't sound obnoxious, although, the blend reminds me of the Christian Lacrooix/Avon collaboration “Rouge”. It really is hilarious — I'd like to have both of her scents just for the bottles. Wish somebody would start selling them online! I am taken with that IC bottle – where does the juice come out? does the head pop off? does it shoot from her face? her bottom? i just clicked into the site (on your rec)- very jaunty! Most flash sites annoy me, but it is very very cute & not too annoying to move around. Better than having it shoot from her face, maybe. Off with her head! Hey, hon! Chiming in late to say that the head unscrews (you can barely see the line, sort of where the neckline of a blouse would be) and there's an atomizer underneath. The original IC was charming — a spicy floral with a little dirtiness. The new IC was there for the NY sniffa and urk — really, really marine. To me it smelled like that iodine-rot smell of walking on the beach. Not worth it even for the bottle. Hey, where have you been lately? Doing something fun, I hope? Iodine rot — no thanks! I went on vacation out of internet range and didn't tell anyone, for no particular reason, and feel bad to discover (duh) I worried some folks. Back on the blog tomorrow. You told your family though, right? Ha, hope you had a great time. It is good to go without internet access for a time, I think. Nah, even worse — they came with me. Watching two teenagers suffer from technology deprivation just added to my twisted sense of fun. I'd suggest things like, “why don't you go pick some lettuce? It's a lovely day for a walk!” just to watch their faces. Go pick some lettuce, LOL! I'm sure that went over well.